Omisore also announced that he will be running for Governor of Osun state on the platform of SDP on September 22, 2018. Senator Iyiola Omisore has decamped from the Peoples Democratic Party (PDP) to the Social Democratic Party (SDP). The Senator, who said that he is not new in Nigeria’s political terrain, added that he was part of the founding fathers of the Alliance for Democracy (AD) in 1999. According to Daily Post, Omisore also announced that he will be running for Governor of Osun state on the platform of SDP on September 22, 2018. He also called on members of the party and his supporters to join hands with him to achieve his desire of ruling the state. The Senator in a statement issued to newsmen, said “It is pertinent to note the historical pathway of my engagement in the political affairs in Osun state, and indeed at regional and national levels. I played a pivotal role in the creation of the now defunct Alliance for Democracy (AD) when the country returned back to democratic ruling in 1999 and I became the Deputy Governor of this great state. “It is intrigues, dishonesty and loss of vision in vociferous attacks on my person that led to my departure from the AD and foray in the PDP. My pathway of commitment to state as a distinguished Senator, and Chair of the Committee on Appropriations speak very loudly of my commitment to Osun state, evidenced in the volume of allocations and projects in the state. “This record remains without a parallel. My commitment to its citizens is without contest as over many years, I have reached to provide access to jobs, enterprise and social assets for our people through my political, professional, business and social networks. “In moving forward, and way from the PDP, this commitment to Osun state shall remain resolute and unshaken. It is my state of origin, the people my people, and where ever I go, I shall remain their dutiful son, and leader. Nothing can change that. “Notwithstanding my enormous contributions over the past years or so to building the PDP, after very deep thought and the widest consultations with my God, my family, my supporters in and outside Osun state, It is with great concern that I have made a very expedient decision today, to withdraw my membership from the Peoples Democratic Party (PDP) and join the Social Democratic Party (SDP). “On the platform of the SDP, I shall with the support of my supporters, followers, and the electorate of the state, seek the nomination to contest for, and by His grace, be elected as the Executive Governor of Osun state on September 22, 2018. 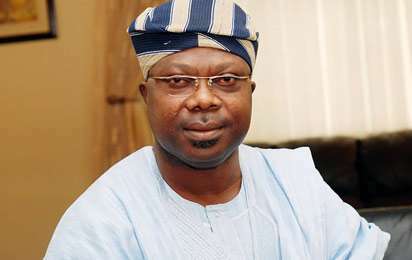 Omisore was the Deputy State Governor of Osun State during the administration of Governor Adebisi Akande from 1999 – 2003. He was elected to the Senate to represent Osun East constituency in April 2003. In 2004, the Oyo State High Court sitting in Ibadan acquitted Omisore of conspiracy and murder of former Justice Minister, Chief Bola Ige (SAN). This will be his second time to run for Governor in Osun state. In 2014, he contested on the platform of the Peoples Democratic Party(PDP) and lost election to Rauf Aregbesola.